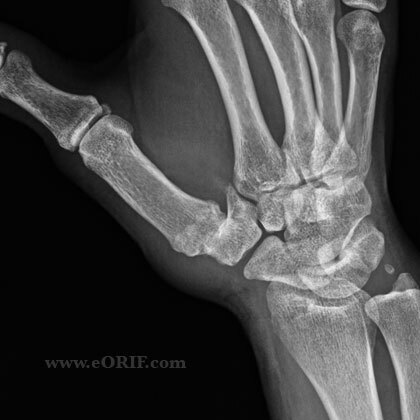 Extra-articular ligament reconstruction to stabilize the thumb carpometacarpal (CMC) (basal) joint by routing a portion of the flexor carpi radialis (FCR) through the base of the thumb metacarpal. Sixteen ligaments stabilize the trapezium and trapeziometacarpal joint. The dorsoradial and deep anterior oblique ligaments (beak ligament) are most important in stabilizing the trapeziometacarpal joint. (Bettinger PC, J Hand Surg 1999;24Am:786). 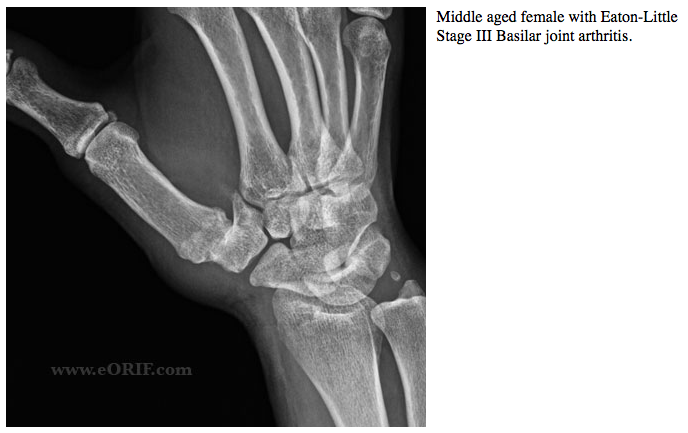 Night pain and limitations in ADL's due to thumb CMC arthritis which has failed to respond to non-operative treatment. CMC Fusion: indicated for young, manual laborers. Patients with metacarpophalangeal hyperextension require volar capsulodesis or arthrodessis conconmitantly. Consider resection of the proximal third of the trapezoid for patients with pantrapezial arthritis. See Tomaino MW, AAOS OKOfor video and in dept discussion. Expose the CMC joint through a triradiate incision along the radial border of the thumb metacarpal. Identify and protect the sensory branch of the radial nerve, the radial artery, and the palmar cutaneous branch of the median nerve. Blunt retractors are placed beneath the extensor pollicus longus (EPL) in a dorsal and ulnar position and beneath the APL radially and volarly. The radial artery courses within this interval. the artery is retracted dorsally and ulnarly. Longitudinally incise the dorso-radial capsule to expose both the carpometacarpal and scaphotrapezial joints. Split the trapezium into two or four pieces with an osteotome or saw and remove them with a rongeur. Avoid injury to the joint capsule and FCR tendon. Excise the base of the thumb metacarpal perpendicular to its longitudinal axis. Evaluate the scaphotrapezoidal joint by pulling on the index and long fingers. If severely arthritic excise to 2 to 3 mm of the proximal trapezoid. 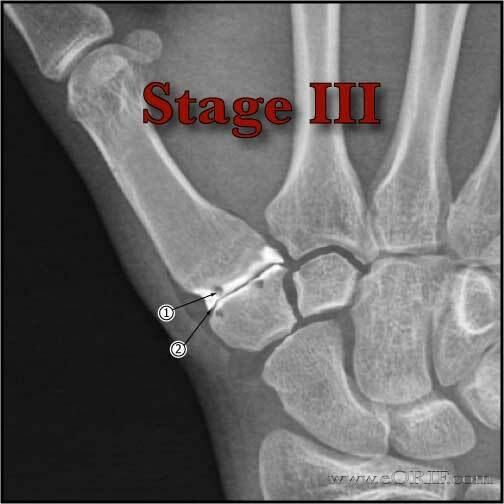 Place a hole in the metacarpal base 1cm from the osteotomy between the extensor pollicis brevis (EPB) and the extensor pollicis longus (EPL) tendons with a gouge or drill positioned perpendicular to the plane of the thumbnail. Harvest 10–12 cm of the FCR tendon through a transverse incisions in the forearm proximally at its musculotendinous junction. Free the distally based tendon from its insertion and pass it into the metacarpal medullary canal and out of the dorsal cortical hole. Place a nonabsorbable figure-of-eight stitch in the deep capsule for later use. 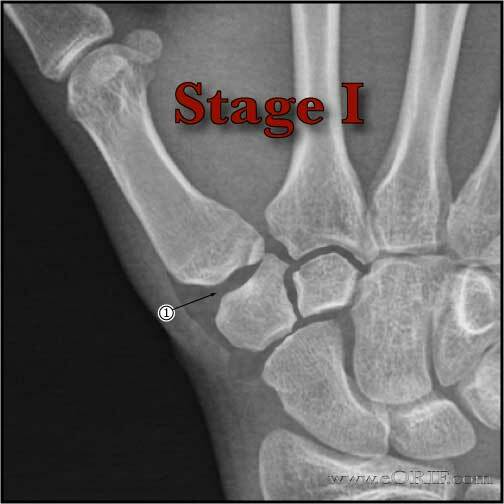 With the thumb in palmar abduction, stabilize the metacarpal by inserting a 0.045 in. Kirschner wires (K-wires) into the index metacarpal and trapezoid. Close capsule with nonabsorbable suture. Immobilize the arm in thumb spica splint. Berger AJ, Meals RA. Management of osteoarthrosis of the thumb joints. J Hand Surg Am. 2015 Apr;40(4):843-50.